iDevices was one of the first companies to announce plans for producing HomeKit-compatible products, focusing primarily on switches and outlets but also branching out a bit with a thermostat. Earlier this year, iDevices was acquired by major electrical equipment manufacturer Hubbell, but the iDevices brand and product lineup lives on. 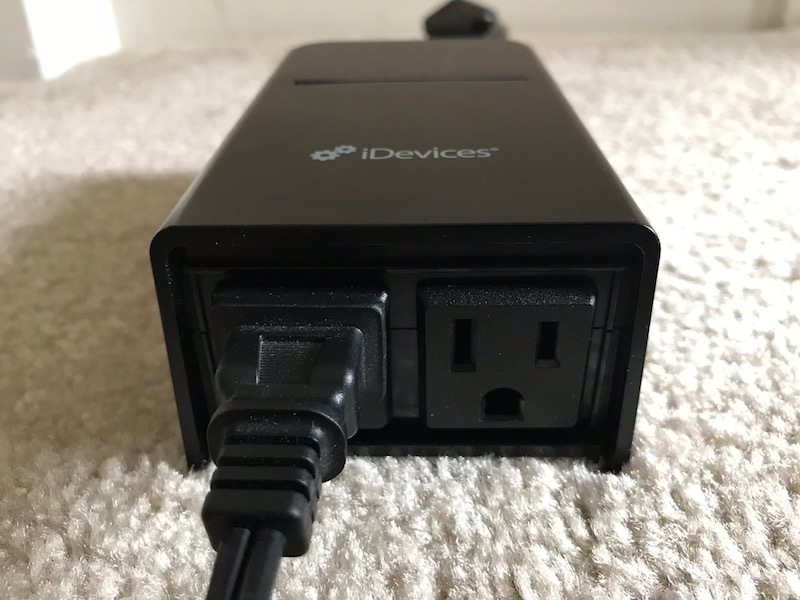 I've been using a number of iDevices products, including the recently launched Wall Switch and Wall Outlet, as well as the Switch and Outdoor Switch that launched some time ago, and I've gotten a pretty good idea of how well these accessories fit into my home and integrate with other HomeKit devices through HomeKit. All of the devices are also compatible with Amazon Alexa and Google Assistant, but for my purposes I focused on HomeKit. iDevices' Wall Switch and Wall Outlet are the latest additions to the company's HomeKit family, and they're the most complicated to install since they require in-wall installation. It's a little bit of a hassle and some users such as renters may not be able take advantage of them, but installation is a pretty straightforward project and they provide a much cleaner and more integrated look to your HomeKit system. As with any other time you're performing electrical work, you should turn off power at the circuit breaker and make sure electricity isn't flowing to the circuits where you're working. iDevices includes step-by-step instructions to walk you through the entire installation process and also includes some helpful videos on its YouTube channel. The Wall Switch can be installed in single pole, 3-way, and 4-way configurations, although you'll need to make sure all switches in 3-way and 4-way configurations are replaced with iDevices Wall Switches so they can coordinate their management of the circuit. Regardless of configuration, a neutral wire is also required at the switch location in order to power the Wall Switch, so if you don't have one, you'll have to decide whether it's worth getting new wiring installed to the switch or forgoing using a smart switch at that location. 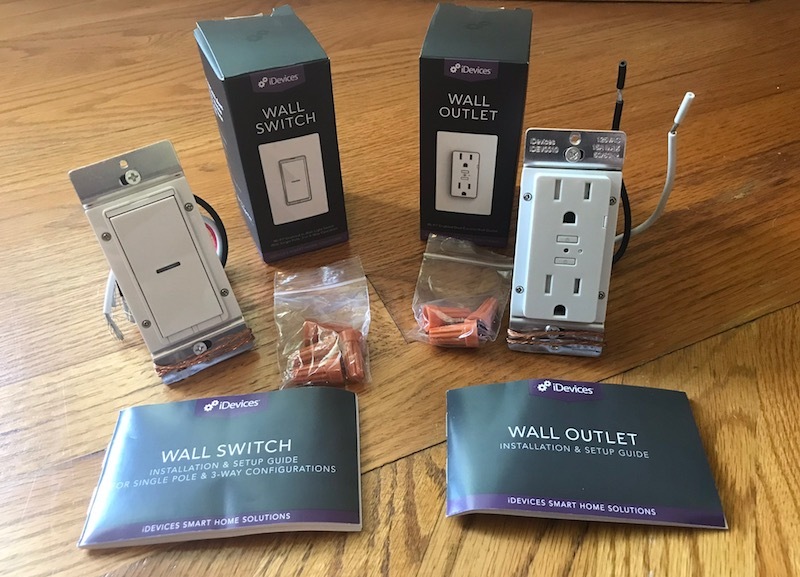 With those considerations out of the way, installation is straightforward and only requires you to disconnect the wires from your existing switch and connect them to the Wall Switch or Wall Outlet using the wire nuts iDevices includes in the box (or existing ones that may already be used for your previous switch or outlet). A voltage detector is helpful for installing the Wall Switch to differentiate between line and load wires and make sure you're hooking them up to the proper wires on the switch. Three-way switch installation is a little bit more complicated, but the instructions and videos will walk you through it. 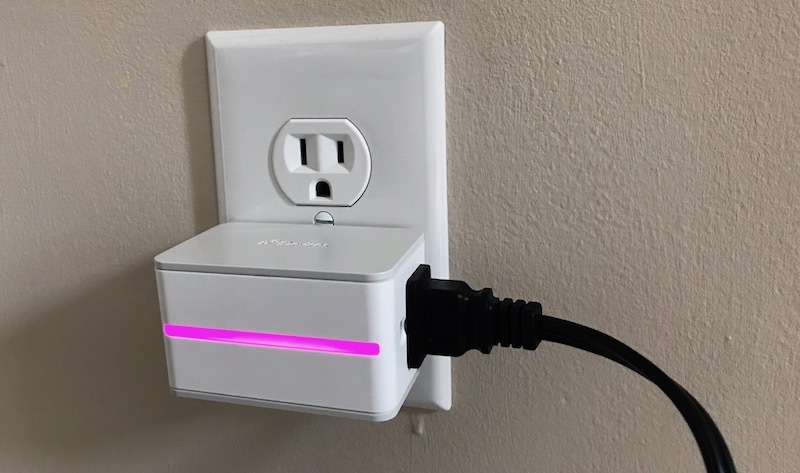 Once the Wall Switch and Wall Outlet are wired up and screwed back in, faceplates (not included) installed, and the circuit breaker turned back on, you're ready to set them up to use with the iDevices ecosystem and HomeKit. 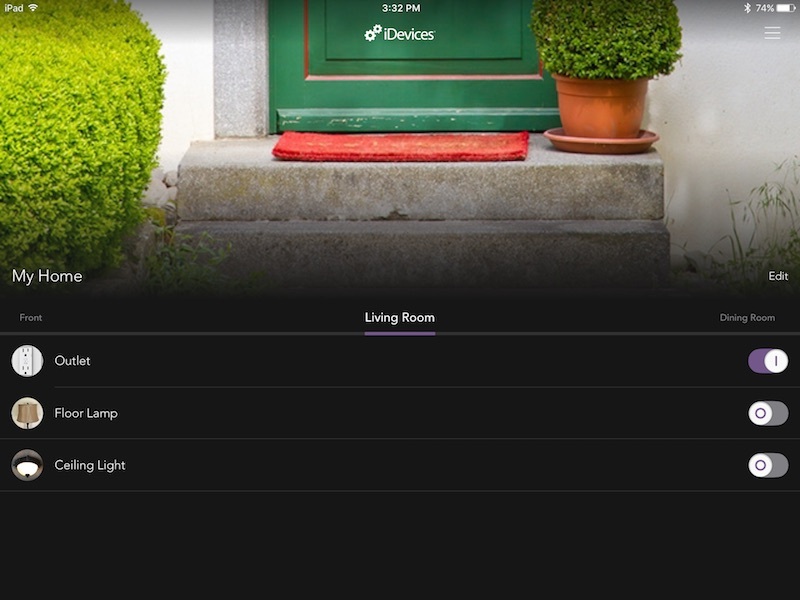 The iDevices Connected app serves as the home for iDevices products, letting you configure the products to connect to Wi-Fi and integrate with HomeKit. The process is simple and takes just a few minutes, during which you'll not only get the devices up and running but properly named, placed into HomeKit rooms, any desired custom names and image thumbnails set, and schedules set. 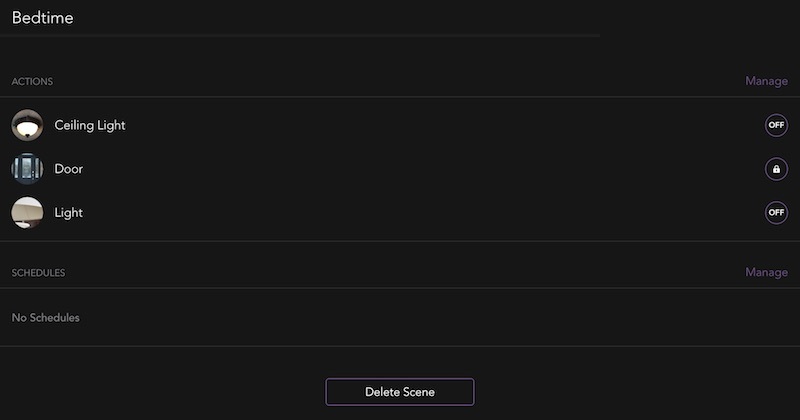 The app also makes it easy to group devices together into scenes, set up triggers such as geofencing your home for coming or going, and more. Once you're all set, you can use either the iDevices Connected app or Apple's Home app (or Control Center widget or Siri) to monitor and control the switch and outlet. 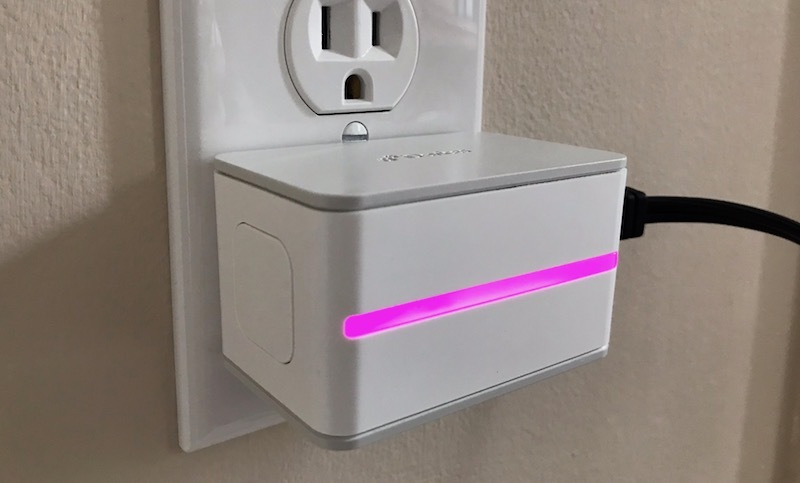 Both the Wall Switch and Wall Outlet include small LED lights on them that will blink in different colors to indicate device status during setup and troubleshooting, and during normal operation they can optionally be used as night light functions to help you locate them on the wall in the dark. The color of the night lights can be fully customized within the iDevices Connected app. The Wall Switch looks largely like a standard rocker switch except for the LED in the center of it, but the operation is a little bit different. While a standard switch will click into the on or off position and stay there, the iDevices Wall Switch clicks into the desired position but the returns to the central resting position once released. That's a function of it being a smart switch, as when you're controlling the switch through your phone it's not going to physically move the rocker. I'm not a huge fan of the feel of the switch, which wiggles a bit when registering a press, but I can live with it. As for the Wall Outlet, I installed this in a location where I replaced a standard outlet that used a timer to control a floor lamp. The Wall Outlet lets me forego the additional timer, yielding a cleaner look and the ability to control timing for the lamp via the the iDevices app or Apple's Home app. Each of the two outlets operates independently, so I can program the one my lamp is plugged into to turn on and off at specific times of the day while the other outlet can remain on at all times or operate on a different schedule. While the ability to monitor and control my floor lamp from my phone and integrate it into other HomeKit scenes is fantastic, one downside is that it is much more difficult to control manually if you don't have a phone handy. My old timer had large buttons on it I could use to manually override the timing cycle if I needed the light turned on earlier in the evening on a particularly cloudy day, for example. 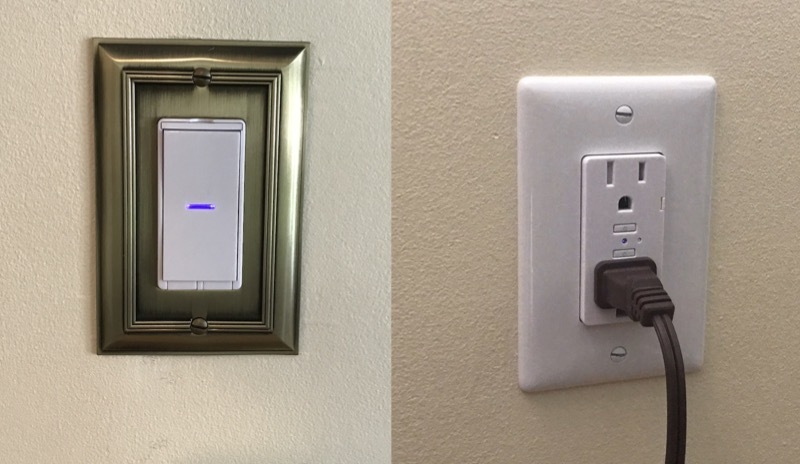 To accomplish the same thing on the Wall Outlet, you have to press a very tiny button on the face of the outlet to manually toggle the power on or off. Particularly when you have things plugged into both outlets, it's tricky to get in there and press the button. HomeKit switches and outlets are certainly handy, particularly for those people who are looking to incorporate them into broader home setups to group devices together for easy control via app or voice. But the main problem is still cost — it's not cheap to build Wi-Fi connectivity, security, licensing, and more into a light switch. So while a standard light switch only costs a few dollars, the cost of these smart switches and outlets starts to add up quickly, especially if you want to install them widely throughout your home. iDevices' Wall Switch and Wall Outlet are priced at $99.95 each, so make sure you do the math for your own home if you're thinking about anything more than installing these in a high-priority location or two. For those who can't or don't want to take on the task of wiring up new switches and outlets or who are looking for cheaper ways to control their electrical devices via HomeKit, iDevices also offers some plug-in options to give you HomeKit control over specific outlets. 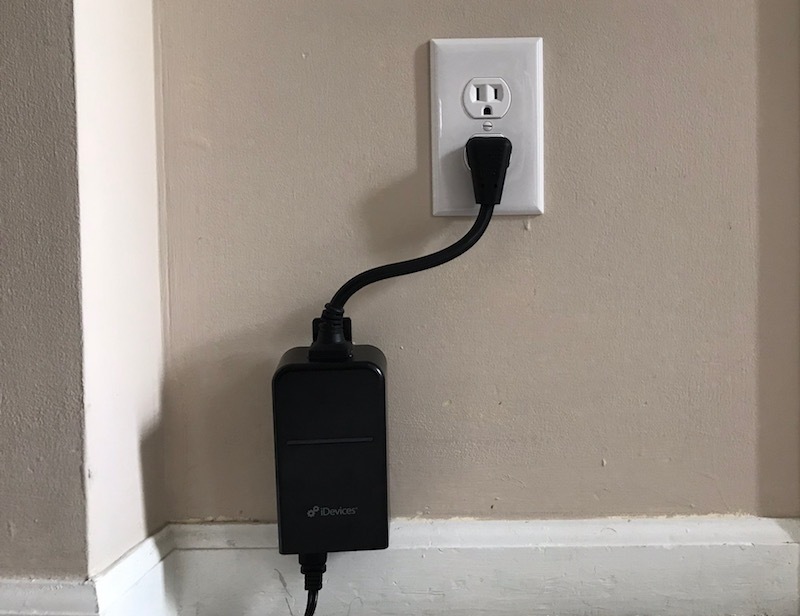 The first option is the simply named Switch, which plugs into an electrical outlet and houses the technology for connecting to your network via Wi-Fi and controlling devices plugged into its own outlet. The iDevices Switch is on the large side, but it does its job well, integrating easily with the iDevices app and HomeKit to control lamps and other devices. The Switch includes a couple of nice features such as a large button on the side for manually turning the switch's outlet on and off. Compared the Wall Outlet, the Switch is much easier to control manually, as the button is very easy to access on the side of the box. The Switch also includes a handy LED strip along the face of it, which not only serves as a status light during setup and troubleshooting but also as a night light. 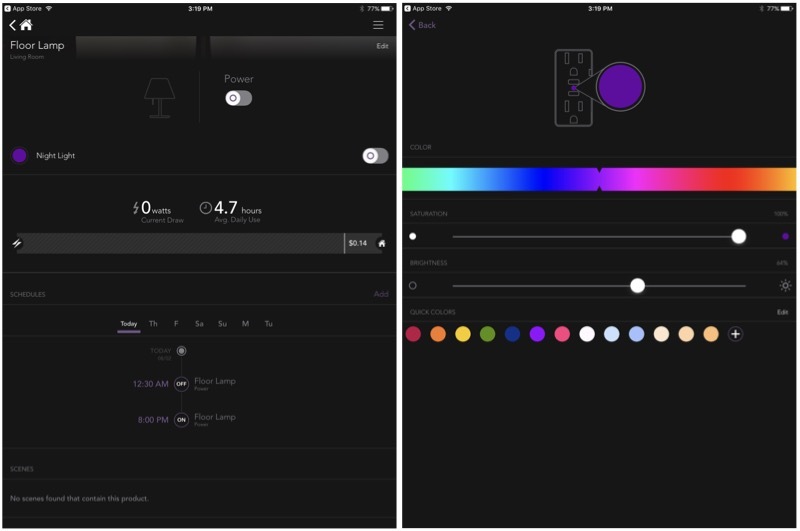 The color of the night light can be fully customized through the iDevices Connected app, or turned off entirely. The Outdoor Switch is a similar option, but as the name implies it's intended to be used outdoors. It's a surprisingly bulky product that needs to be mounted on a screw or set on the ground rather than supported entirely by the outlet it's plugged into. As a result, the design includes a short cord to connect the main body of the Outdoor Switch to an outlet. Due to the short length of the cord, the Outdoor Switch will need to be mounted close to the outlet it's plugged into, but the thickness of the cord also makes it a bit difficult to manipulate into the desired position. The Outdoor Switch is designed to be mounted vertically, and it houses a pair of outlets on the bottom of its body, placed to protect them as much as possible from the elements. The two outlets do not operate independently, so any items you plug into them will be controlled together. A large button on the side of the Outdoor Switch's body makes it easy to manually control power to the outlets. As with the Switch, the Outdoor Switch also includes an LED strip for status information and night light functionality. I've generally used my Outdoor Switch for items such as Christmas lights, letting me schedule my display to come on and go off every night during the holidays. My electrical setup isn't ideal, as the outlet on my porch is fairly close to the ground and thus I don't have room to hang the Outdoor Switch nearby and instead I have to leave it sitting on my porch. That positioning doesn't protect the outlets as much as a vertical hanging orientation, but the location on my porch helps limit general exposure to the elements. Overall, both the Switch and the Outdoor Switch have worked reliably in my testing, although it's disappointing they couldn't be made slimmer. Some of that is due to the amount of electronics inside and some of it is simply due to the space requirements for including an outlet or two to plug items into the switches, while the Outdoor Switch adds requirements for weather resistance. As noted at the top of this section, these plug-in switches offer a significantly cheaper way to bring HomeKit control to items around your home compared to the in-wall installations. The standard Switch costs $29.95, which is still a decent chunk of change if you're looking to install them widely throughout your home, but it's a heck of a lot cheaper than the in-wall alternatives. The Outdoor Switch is pricier at $79.95, but it does come with the rugged rain-resistant design needed for outdoor settings. It's still early in the smart home market, but with HomeKit maturing and more manufacturers entering the field, we're starting to see a broader array of options in the various product categories. 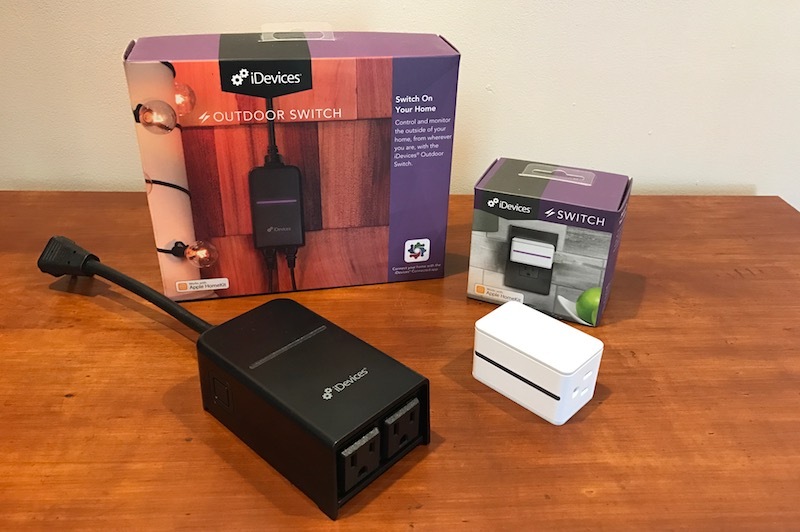 iDevices has the advantage of being one of the first to market with HomeKit switches and outlets, and it's allowed them to refine and expand their product lineup to suit a variety of needs. iDevices' products are well-built, with good documentation and a solid app to set up and control them, so that makes them a worthy addition to most smart home setups. The Wall Switch and Wall Outlet are fairly unobtrusive in replacing the utilitarian switches and outlets we're accustomed to, making it easy to miss at a glance that these are smart home products, which is the entire point. My major hangup continues to be price, however. At $100 a pop, very few people are going to want to install these throughout their homes at a total cost easily running into the thousands of dollars. That means most users will need to be selective in installing these in just a few locations, which can still be useful but falls short of creating a fully smart electrical system. The Switch offers a middle ground, giving you the benefit of smart outlets at 30 percent of the price of the in-wall versions, but at the cost of aesthetics and without the ability to control hardwired lights and appliances as you can with the Wall Switch. As a result, even with the lower cost I would still tend to be rather selective in my usage of these around my home. All of these iDevices products, as well as a few others, are available through the company's online store as well as generally at slight discounts through the company's Amazon storefront. Note: iDevices provided the Wall Switch, Wall Outlet, Switch, and Outdoor Switch to MacRumors free of charge for the purposes of this review. No other compensation was received. MacRumors is an affiliate partner with Amazon and may earn commissions on purchases made through links in this article. Ours, and other British related / Commonwealth countries, use completely different looking wall sockets, you see. $100 for a light switch is absurd, especially since it's not dimmable. I wish HomeKit would take off like Alexa. I see all these cool things out there ready to work with Alexa but what I’ve seen, so far, for HK is so limited in comparison. I assume this is because Apple hasn’t opened up HK to all these manufacturers, or what’s going on? I’ve come so close to jumping on the Echo/Alexa train but I’m holding off in hopes Apple plays catch up very soon. I was waiting for apples response to the echo for home automation, and the homepod made the decision very easy for me, the homepod is 10x the price of the echo dot (when it's on offer). I can't justify one homepod, never mind the 5 I'd need. The dot is affordable and has a much better voice assistant. It's a pity as I thought Apple wanted to be a real player in this market. For those that find the iDevices wall switch too expensive, Leviton makes something similar for $50 that’s also dimmable, and one without dimming for even less. I’ve had mine for a few months and never had a problem with it. I think it’s more like that Apple required stricter security standards. This makes it cost more for vendors to support HomeKit. I'm not really sure what you could use the sockets for. Turning a lamp on/off remotely might be fun for a few hours (lol), but what other appliances would you connect up to it? I agree. And with Siri being everywhere (Mac, iOS, watch), it would be so convenient to just use any of those devices to give it voice commands, which is something Amazon doesn’t have right now. I get their concerns but this is such a missed opportunity for Apple. Once people have invested too much into Alexa/Echo I cant see them switching over to HomeKit so essily. Apple have moved to software certification, so many many more vendors can now jump on board with just a firmware update. Ah! I was not aware of this. I’m cerrainly looking forward to it, then. I’ve been holding off patiently so I hope it pays off. Thanks for the info! I’ll have to look it up and read up on it. They’re due to launch very soon, couple of months, does the same job but without some of the hassle (just swap out and mains wire still). Added bonus, they physically switch and look exactly like our normal faceplates and stuff.